Star Wars movies are among the most beloved films of all time. 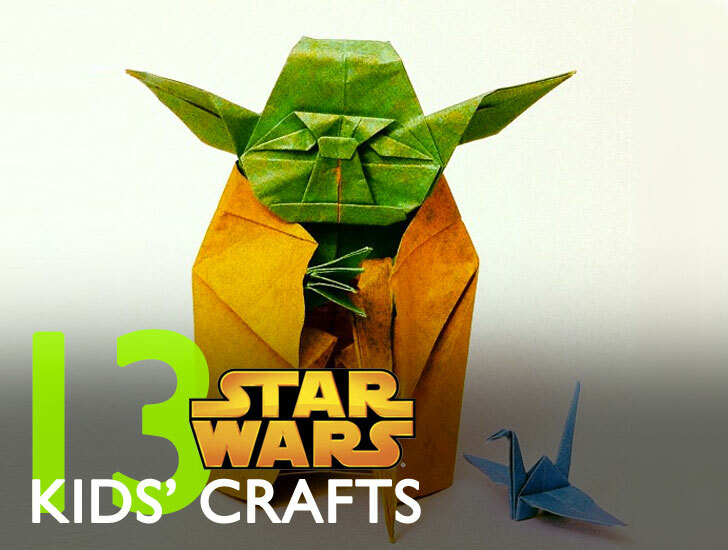 To commemorate May the 4th (May the 4th be with you), we've gathered 13 Star Wars-themed craft and activity ideas that will appeal to kids, while making great use of simple materials and a whole lot of ingenuity. So gather some eager Jedis and padawans, prepare to jump to lightspeed and may the Force be with you! 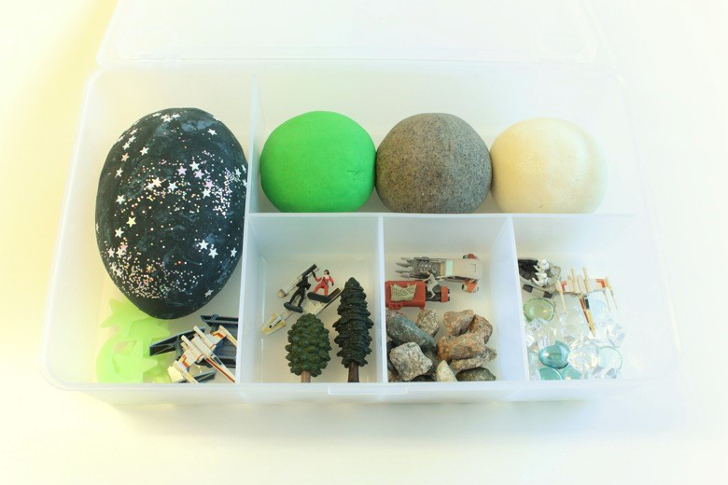 Mama Papa Bubba has some ingenious ideas for playdough kits—boxed up playdough and assorted extras that can be used to tell a particular story. They’re great for stimulating creative play and can also be gifted to friends. This Star Wars-themed kit uses different colored dough batches to represent different planets in the Star Wars universe. Simple, sweet, easy! Image: Am I a Funny Girl? There’s nothing like a bit of dress-up fun to get into the spirit of a movie. These Jedi robes from Am I a Funny Girl? 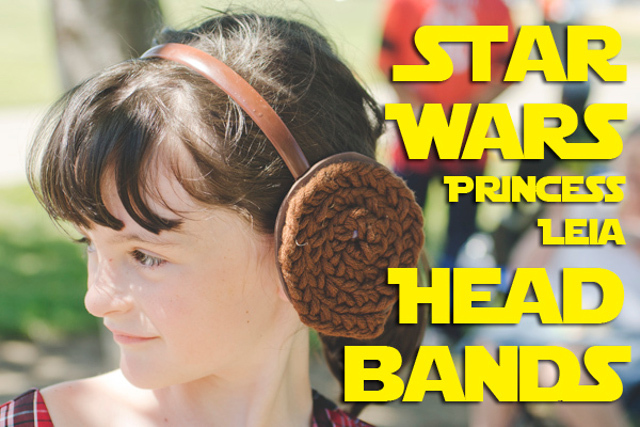 are quick and easy to make, but the Leia headbands are simply genius! And if a little Leia wants a swashbuckling Han Solo by her side, the blog also features a simple yet effective Han costume. This craft is one for older children with adult supervision and assistance due to the precision cutting, but all children will love the results. 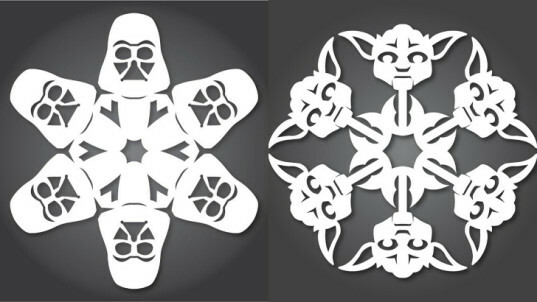 Anthony Herrera Designs has five different sets of free downloadable snowflake cut outs featuring characters from all seven Star Wars films. What’s the best antidote to a slothful movie marathon? A bit of a stretch, of course! Cosmic Kids Yoga produces many themed yoga videos for little ones, and the Star Wars episode encourages kids to imagine themselves as a strong and brave Jedi master as they move through warrior pose and hold their make-believe lightsabers high. Cuteness may well ensue! 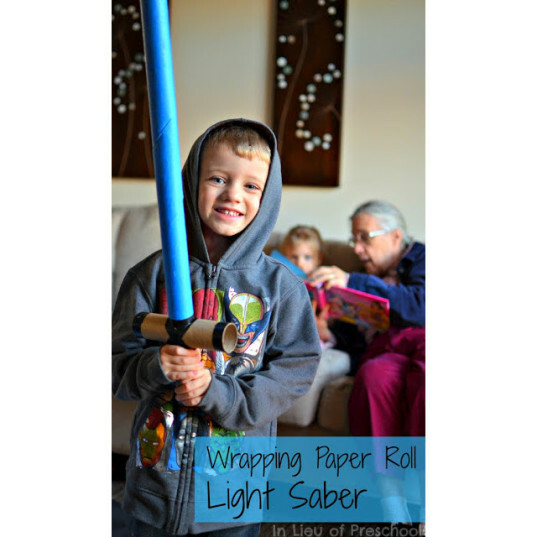 There are many tutorials for making lightsabers out of swimming pool noodles and so forth, but this wrapping paper roll version from In Lieu of Preschool has two stand out features: firstly, you may already have several cardboard tubes on hand from your festive season wrapping paper, and secondly, this design has a cross bar so it can easily be customized to look like Kylo Ren’s cross-shaped red lightsaber in The Force Awakens. The droid BB8 provides the cute factor in The Force Awakens. Silly Fun Time‘s tutorial for a BB8 figure constructed from a paper plate is made all the more adorable by the fact that the plate is held in place with a split pin, so the droid’s body can roll along just like in the movie. Once the movie is over, kids’ imaginations will still be buzzing. 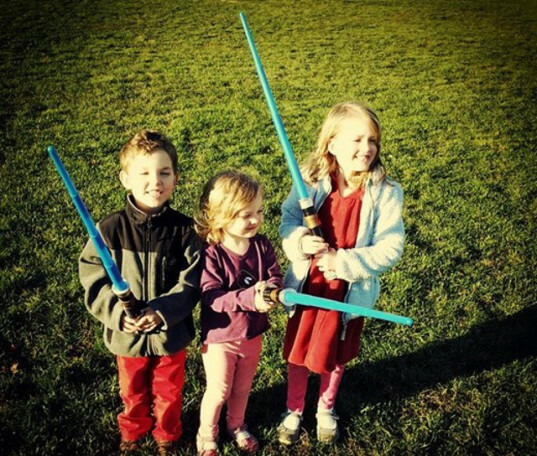 Mike, the “Dada” of the blog Mama Smiles, has shared some really practical tips for sure-fire success with storytelling by weaving your child into all the Star Wars action. These Star Wars-themed paper mask printables are available as affordable downloads from Etsy store Tea Time Jo. They’re a low-cost option for entertaining a number of kids at once, with the added bonus that once the party’s over they won’t be sitting in a landfill for the next few thousand years! 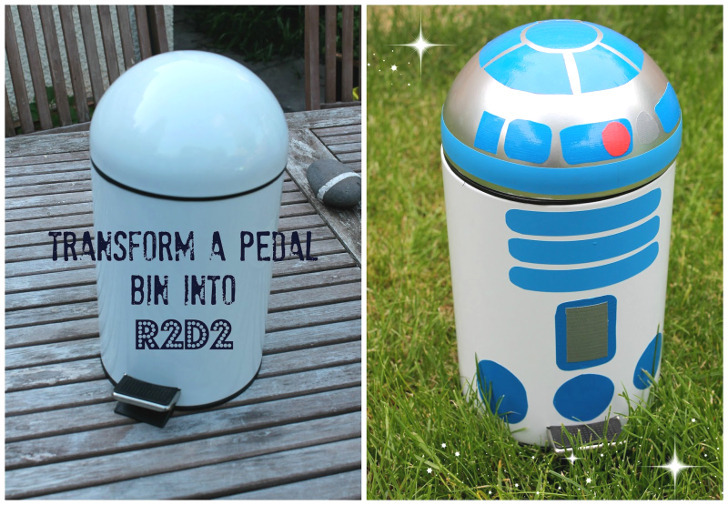 This is one of those forehead-slap-inducing, “Why didn’t I think of that?” DIY projects: Dreaming of a Craft Room shows you how to transform a simple white dollar store pedal bin into R2-D2. Brilliant! 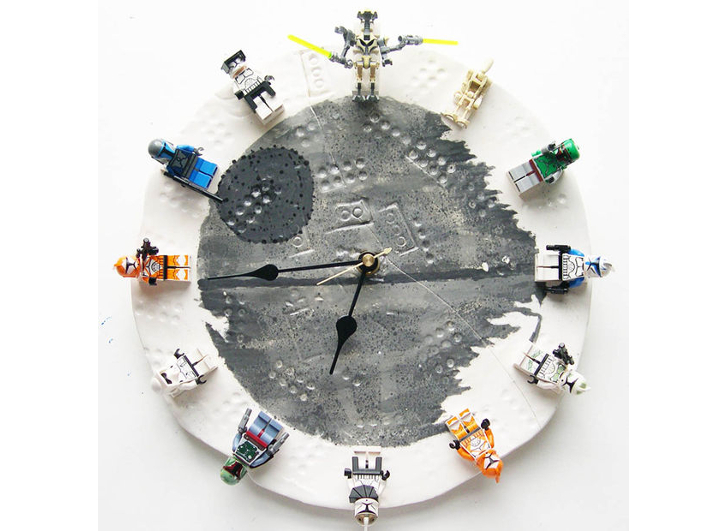 I can’t decide if the best thing about this clock is that it was made by a four year-old, or that it doesn’t require rendering perfectly good LEGO figures unusable. This step-by-step Instructables tutorial is easy and keeps kids engaged since they can change the figures that mark the hours as they wish. 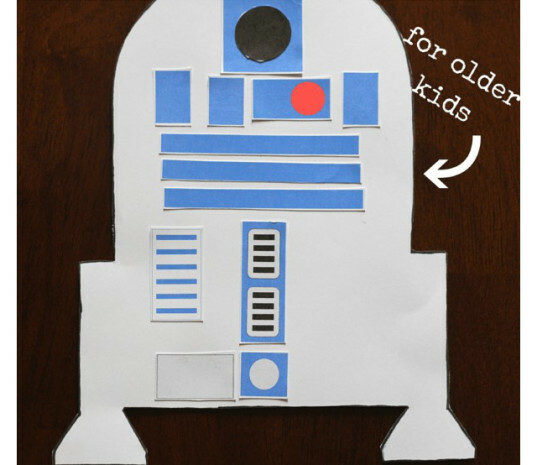 If you want a really simple craft that can accommodate children of different ages and levels of dexterity, this R2-D2 paper cut-out printable from Mom Inspired Life is perfect. The great thing is there are minimal rules, and Danielle has provided sample images of the level of complexity you might expect to see from both younger and older kids. This craft project from 320 Sycamore is definitely one for adults to prepare for children, but the effect is so stunning—and the total cost so low!—that it is worthy of a place in this roundup. This supersized piece of wall art will transform a child’s bedroom and provide the perfect backdrop for hours of epic space battles. This awesome origami Yoda is a craft for children with a lot of patience and/or focus, and the results will certainly be rewarding. 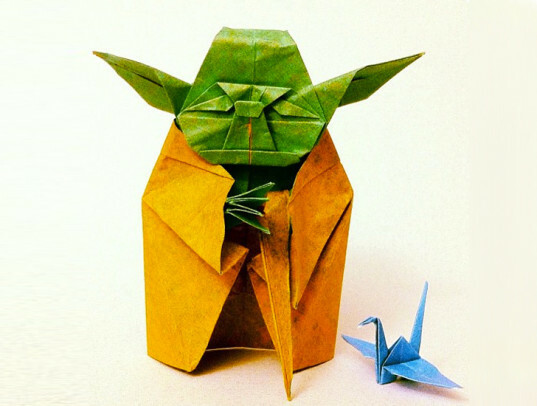 The finished origami pictured is by origami master Yoyo Ferro working from a design by Fumiaki Kawahata. Full how-to instructional videos can be found at Marigami Origami. Mama Papa Bubba has some ingenious ideas for playdough kits—boxed up playdough and assorted extras that can be used to tell a particular story. They're great for stimulating creative play and can also be gifted to friends. This Star Wars-themed kit uses different colored dough batches to represent different planets in the Star Wars universe. Simple, sweet, easy! There's nothing like a bit of dress-up fun to get into the spirit of a movie. These Jedi robes from Am I a Funny Girl? are quick and easy to make, but the Leia headbands are simply genius! And if a little Leia wants a swashbuckling Han Solo by her side, the blog also features a simple yet effective Han costume. What's the best antidote to a slothful movie marathon? A bit of a stretch, of course! Cosmic Kids Yoga produces many themed yoga videos for little ones, and the Star Wars episode encourages kids to imagine themselves as a strong and brave Jedi master as they move through warrior pose and hold their make-believe light sabers high. Cuteness may well ensue! There are many tutorials for making lightsabers out of swimming pool noodles and so forth, but this wrapping paper roll version from In Lieu of Preschool has two stand out features: firstly, you may already have several cardboard tubes on hand from your festive season wrapping paper, and secondly, this design has a cross bar so it can easily be customized to look like Kylo Ren's cross-shaped red lightsaber in The Force Awakens. The droid BB8 provides the cute factor in The Force Awakens. 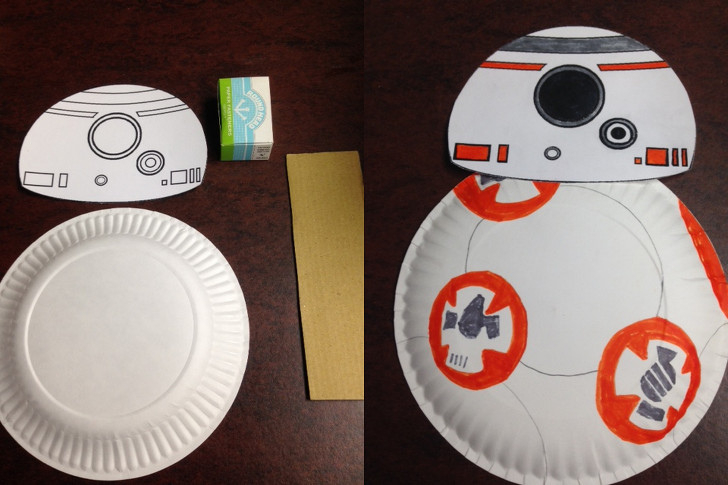 Silly Fun Time's tutorial for a BB8 figure constructed from a paper plate is made all the more adorable by the fact that the plate is held in place with a split pin, so the droid's body can roll along just like in the movie. Once the movie is over, kids' imaginations will still be buzzing. Mike, the "Dada" of the blog Mama Smiles, has shared some really practical tips for sure-fire success with storytelling by weaving your child into all the Star Wars action. 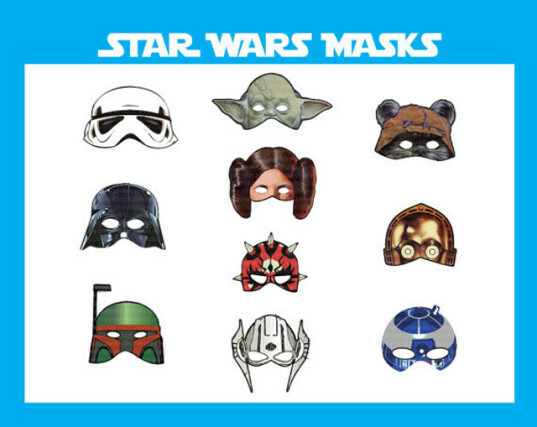 These Star Wars-themed paper mask printables are available as affordable downloads from Etsy store Tea Time Jo. They're a low-cost option for entertaining a number of kids at once, with the added bonus that once the party's over they won't be sitting in a landfill for the next few thousand years! This is one of those forehead-slap-inducing, "Why didn't I think of that?" DIY projects: Dreaming of a Craft Room shows you how to transform a simple white dollar store pedal bin into R2-D2. Brilliant! I can't decide if the best thing about this clock is that it was made by a four-year-old, or that it doesn't require rendering perfectly good LEGO figures unusable. This step-by-step Instructables tutorial is easy and keeps kids engaged since they can change the figures that mark the hours as they wish. This craft project from 320 Sycamore is definitely one for adults to prepare for children, but the effect is so stunning—and the total cost so low!—that it is worthy of a place in this roundup. 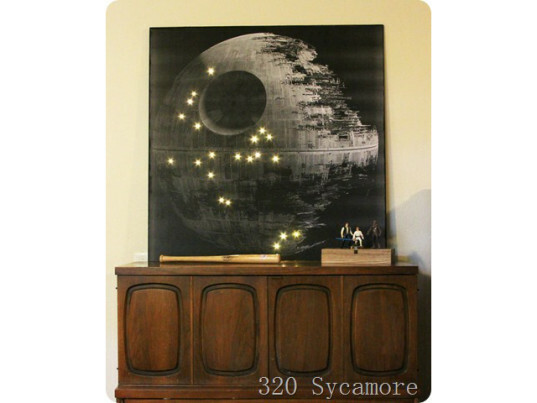 This supersized piece of wall art will transform a child's bedroom and provide the perfect backdrop for hours of epic space battles.